Special product for leather goods protection. Based on clay desiccant and no dust envelope. Unlike other solutions for the leather goods protection, Moisture Grabber is not based on the release of biocides or fungicides, but on the simple principle that removing moisture prevents the formation of mold and odours. It removes the excess of moisture and preserves the gloss of the leather and does not modify the leather's scent. Moisture Grabber ensures total safety for use in the industry: it does not cause allergies or skin problems. Moisture Grabber is printed with a flexo technology and can be used in the final packaging of high quality products without the risk of colour transfer and keeping intact the appeal of the packaging. 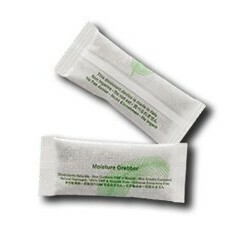 Grabber guarantee the maximum cleanliness and allows to see through the natural desiccant. The non-woven used, developed for food application, has been chosen to guarantee the absence of any possible hazardous component of the product. We ensure full transparency by providing all the technical documentation and complete analysis (as required by European standards) on all the product components.